With fed-up flight attendant Steven Slater making headlines for what some view as the greatest job exit in recent history, we thought it was high time to discuss a few airline travel do’s and don’ts (for the record, we think there was probably a more, shall we say refined, way for Mr. Slater to quit his job, but that’s fodder for another day). We hope that these simple tips will prevent future in-flight meltdowns from the many men and women who keep us hydrated, answer our questions, calm our fears of flying and deal every day with what must certainly be some of the worst behavior on the ground or in the not-so-friendly skies. It was all so very civilized. And get a load of all of that food! No peanuts for Mr. and Mrs. Pennebacker, that’s for sure. While it’s doubtful that the airline passengers of today (and the flight attendants for that matter, because to be honest we aren’t too fond of the Applebee’s employee, khaki-pants-and golf-shirt look for our in-flight professionals) will go back to the days of suiting up, we encourage those traveling both for business and pleasure to put a little effort into your attire. Perhaps it shouldn’t be so, but when we dress with class, we are treated with class. 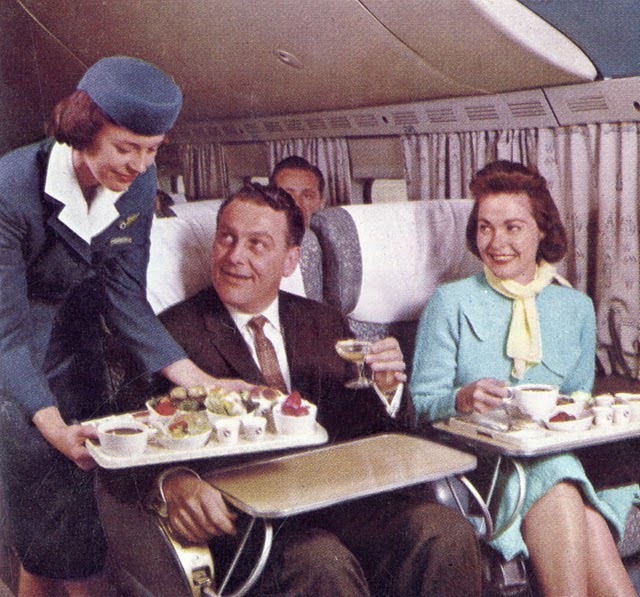 And who knows, you may even get a free upgrade to first class for looking so snazzy! 2. Read the carry-on rules for your carrier. Yes, it’s sometimes like reading a legal document, but when you play by the rules, the process goes much smoother and faster for everyone. If you know your bag is too big for the overhead bin, just check it. 3. Learn and observe the etiquette and , ahem, hygiene conventions for the city, state or country in which you are traveling. 4. Be kind. We’re all in this thing together, so let’s play nice with our fellow passengers and our flight attendants. 3. Drink too much, because even though those bottles are tiny and cute, they pack a punch! Now, fasten your seatbelts, enjoy the flight and give your flight attendant a break by behaving like a civilized, adult human being and not like a hyena.